I have now received the delivery of the new cycle tops, and very smart they look too. In order that I may deliver them to as many riders as possible, I intend to bring them to the New Year meet at Seale, and hope that those of you who ordered the tops can be there as well, and be able to transport them home with you. If you cannot attend on New Year’s Day, please be in contact so that we may arrange a suitable alternative. A reminder that the prices are £31.20 for short sleeved, £34 long sleeved, and £42 long sleeved winter weight. I would prefer that payment is made electronically direct to the West Surrey bank account, and if you e-mail me I will let you know the bank account details. 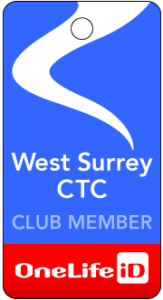 Alternatively, you can pay by cheque on the day, cheques made payable to West Surrey CTC.